Approaches for high-yield solid-state-based ensemble molecular junctions; conducting interlayer-based junctions. A) Conducting polymer PEDOT:PSS (© Nature). 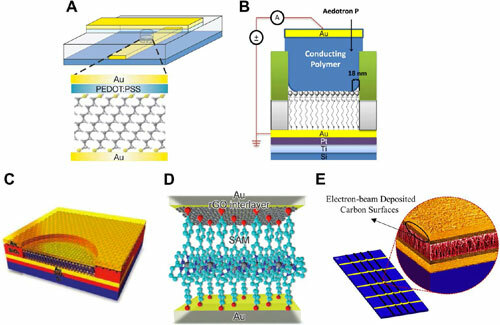 B) Conducting polymer Aedotron P (© ACS). C) Graphene (© Wiley). D) Reduced graphene oxide (© Wiley). E) Electron beam deposited carbon (© ACS). Since the genesis of the research field of molecular electronics, which is generally considered to have begun in 1974 with Aviram's and Ratner's early theoretical research ("Molecular rectifiers"), tremendous progress has been achieved both theoretically and experimentally by scientists and engineers who were fascinated by intriguing physical, chemical phenomena, and potential device applications of molecular junctions.